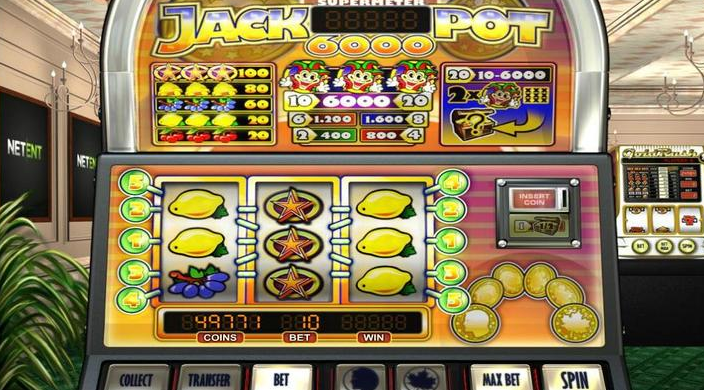 If you enjoy the traditional simplicity of an authentic fruit machine then Jackpot 6000 is the right slot for you. Modelled on the Norwegian styled Jackpot 2000 this game has all the tactility and nostalgia attached to a one-armed bandit but within a relaxing online setting. You can either read more details below or play slots online now. After their foundation in Sweden over 20 years ago, NetEnt has been bringing you beautifully created games since 1996. Their games are built with the player’s user-experience in mind and packed with bonus features and lucrative rewards which makes it easy to understand why they have become one of the leading game developers currently on the market. NetEnt offers some of the best online slots in the world that feature across some of the best platforms currently on the market. Games such as Gonzo’s Quest and Starburst have risen to fame simply because of their immersive gameplay and video technology. Jackpot 6000 is an unusual and unique game for NetEnt but it certainly does not disappoint. If you are looking for more, check out these top-rated slot games. Have you ever wanted to go to Las Vegas, the Motherland of casino games? With inspiration from a Norwegian slot machine called Jackpot 2000, NetEnt have developed a game that will transport you right into the heart of a Las Vegas casino. Designed to look just like a classic casino slot machine, complete with cherries, lemons, grapes, bells stars and wild symbols, this online slot game features exciting 3D graphics, 3 reels, 5 paylines, a doubling game called Heads or Tails and a Super Meter game. Check out this list of best slots you can play and see if this game made it to the cut. Jackpot 6000 has a total of 6 different betting levels and 4 different coin values. The betting levels are 1, 2, 4, 6, 8 and 10. The betting level that you choose will determine the types of lines that are available. You have a 1 out of 2 chance to win in Heads or Tails meaning you can easily increase your winnings. As long as you keep on winning you have the option to keep playing Heads or Tails, or you can cash your winnings at any time during the doubling game and play the Super Meter game. You don’t have to use all your winnings for the Super Meter game, you can click transfer which will save some decent amount of cash per click. If you want to play it safe or let it ride, it’s entirely up to you. In the main game mode, the Joker symbol is your Wild. In the Super Meter game getting 2 Jokers rewards you with a mystery prize. Your rewards can include multipliers of x50, and if you’re lucky x100, but the real prize is winning 6, 000 coins. If you get 3 Jokers you win the top prize. This classic fruit machine is not for the faint-hearted, you’ll have to play big to win big in the online slot game. Dynamic yet still user-friendly, the featured tiered-jackpot in Jackpot 6000 will definitely appeal to certain online slot players. Typical of NetEnt, it’s all about preferences, there is a game for every type of player. If you like high stakes, low limit slots or are somewhere in the middle, Jackpot 6000 has something to offer you. An equally cool game is the Black Widow slot.